My WhatsApp traffic this morning has brought me to write this. Out of nowhere I got a couple of invitations to attend Lohree celebration at local gurdwaras. It seems that that are lots of things I don’t really know about Sikhi. I didn’t know that Lohree (also known as Sankrant, Pongal, Bihu, Bhogali, Magh, Pohi, Bhogi and Loi Loi amongst the Hindi, Tamil, Bihari, Marhati, Malyalam, Bengali, Telugu and Sindhi adherents of the Hindu faith) was a Sikh celebration meant to be celebrated in our Gurdwaras. I did not know that bonfires were part of Sikhi or even Gurdwara activities. Surely the author of the WhatsApp was not referring to the fire that cooked our langgar or made our karah parshaad. I also did not know that our Guruji blessed those who attended such bonfires. The only bonfire story relating to Sikhi I had heard once was of some masands (spiritual mafia) being pushed into it for their crimes towards humanity. Even so, that bonfire was not lit in a Gurdwara, and the masands were not celebrating Lohree. I further did not know that going to Gurdwara on Lohree to witness a bonfire was an excellent opportunity to “Darshankar Guru Maharaj ji” unless of course the author of the WhatsApp meant to say it was a wonderful opportunity to “darshankar the bonfire”, and / or that “the bonfire itself was the guru maharaj ji” for the occasion. Finally, I did not know and could not figure out which shabads from the Sri Guru Granth Sahib (SGGS) would be sung in this “wonderful Kirtan” that would be performed in this Lohree celebration in the Gurdwara. But surely after some 40 years of trying to be a Sikh, studying Gurbani, learning Gurmat and attending Katha, Kirtan and satsang in our Gurdwaras, there must be some things about Sikhi that I do know. I also do know that the SGGS does not contain a single verse that calls upon Sikhs to worship the elements or planets – fire, water, sun, moon, stars etc. But there are numerous verses that tell the Sikh to connect to the Creator instead of His creation – no matter how mighty the forces or objects of this creation. The SGGS further critiques concepts such as “auspicious” and “non-auspicious” moments and acts. Gurbani exhorts the Sikh to not fear the planets and elements and give up “activities meant to please them” but do all one can to please the Creator instead. Further I do know that the Preamble of the SRM defines the Sikh as a human being who deposits his spiritual faith entirely and only in the SGGS. Of course I do know that that are countless Sikhs out there who also know all the above, and more. Finally, I also know that one does not have to have spent some 40 years of trying to be a Sikh, studying Gurbani, learning Gurmat and attending Katha, Kirtan and satsang in our Gurdwaras to know the following additional things. 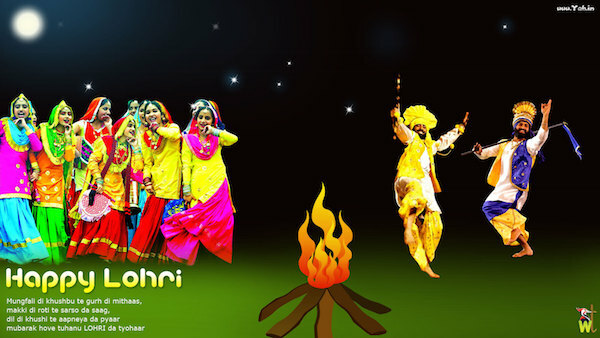 We know that Lohri is a Hindu celebration that marks the movement of the son towards the north (Uttaryan) from the south (Dakshinayan). Our Hindu friends consider the moment to be extremely auspicious given that the sun enters the tropic of capricorn from the tropic of cancer. The celebration date is set to coincide with solstice – the day of the year when the sun remains risen for the longest period. We thus know that Lohree is a festival dedicated to the sun god and god of fire, hence the bonfire ritual on solstice day. On this day, devotees light a bonfire and gather around it. People put rewaries, sugar-candy, popcorn, sesame seeds, gur (raw sugar), moongphali (peanuts) and phuliya or popcorn into the fire as offerings to the two gods and sing till the fire dies out. They also perform prayers as they go around the fire. This is to show respect to the natural element of fire. Milk and water is also poured around the bonfire for thanking the sun god and seeking his continued protection. Given the fact that more than one billion Hindu brethren across India celebrate Lohree, they have given a variety of names in their variety of languages and have a variety of versions to fulfil their spiritual requirements. But the Sikhs don’t have any spiritual name for it. And that is because it is not a Sikh festival. I intend to stay home, do my Rehras, listen to some “wonderful kirtan” CDs I purchased last week, play some computer games with my kids, and watch a movie. I know I will be blessed even if only for choosing to stay away from yet another un-Gurmat activity. Gurunam Singh and Jarnail Singh Ji. Veer Urmela Singh raised great issues which have been answered by Dr Karminder Singh Dhillon in his second Lohree piece titled Lohree, Birthdays, Culture and New Year also on Asia Samachar of Jan 21. Just in case you missed it. Thank you Jarnail Singh for your helpful clarifications. dass has attempted to answer some of your questions in comments on Veer Jespal Singh Brars article on holi. Yes Culture and Religion are intertwined but the aim of Gurmatt is to be heavier on Spirituality than on culture. Culture leads to more Manmatt than Gurmatt. Guru Ji was well aware of this intertwining..and thats why we have the Allahnniah, Ghorrihn, Ramkali sadd etc Banis…these are the Spiritual Gurmatt replacements of the Cultural namesakes. I dont wish to repeat too much here. Karmindar Singh has indeed explained well. So has Urmila Singh raised some queries that need to be answered. Thank you. Maharaj ji SSA JI and Namaskar ji. Fundamentalism.open-mindedness.liberty.rationality.understanding customs and traditions and being able to think critically with a creative mind are the issues that one must look at to understand better history.cultures.languages.religious philosopy and tbeology in general. Lohri is not a religious but cultural custom common to tbe inhabitants of northern india..to celebrate n to usher in the new warmer n ending of the cold season…this is dangerous as they are non compliant with the teachings contained in tbe SGGS Ji. Well said and we learn from elders. Hope this message will be spread to all Sikhs. I have always believed that religion and culture are very closely intertwined …therefore if we start stripping culture away from religion, then what will we be left with? If Lohri is an un-gurmat activity, then should celebrating New Year (which almost every Gurudwara in Malaysia does) and birthdays also be deemed un-gurmat activities? Wonderful article virji- good wake up call for our Sikhs !